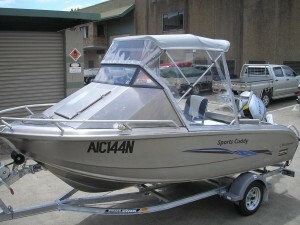 Aluminium Excellence - This Australian designed 4.98 mt side console, plate hull former with a 4 tonne press has produced a unique hull that looks & performs like glass Available in Side & Centre console - dual console / Bowrider - Runabout & Sports Cuddy. 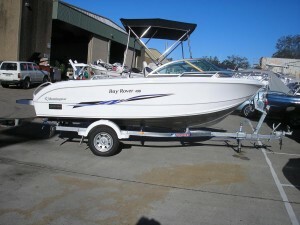 Morningstar boats are the new boat on the block /water . 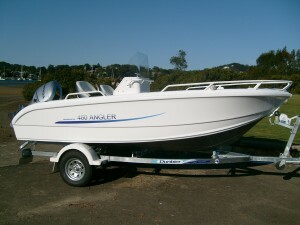 This uniquely designed & built hull performs as it looks - smooth & quiet - even when the going gets tough - Morningstar's Standard appointments include - Checker plate self draining floor - Transom live bait tank - Alloy anchor cover - front casting platform - 60 Litre under floor tank - Navigation lights - Stainless boarding ladder with swim platforms - Transom Tie down lugs AND the "UNIQUE HYDRO HULL" Powered by the BFP Honda 60 Hp fuel injected four stroke motor with "BLAST " low end power band these outstanding hulls leap immediately onto the plane - This F60 Hp Honda is the perfect balance for all the Morningstar range. Trailer sellection includes - Brooker , Dunbier & MacKay. Standard pricing include the Brooker braked trailer with - Galavnised springs & axel, LED trailer lights - Self centreing horozontal skids - 13" alloy rims & long teflon skid supports. Priced from $29,990.00 with the BFP 60 Hp Honda " BIG FOOT " fuel injected 4 stroke motor with " BLAST " on a Brooker trailer including water. 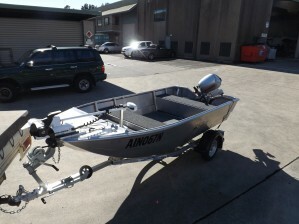 Morningstar's New 498 Plate alloy Runabout is here - This Revolutionary hull is turning heads - " Is it fibreglass or alloy - The smooth line are Morningstar's gift to the boating world. 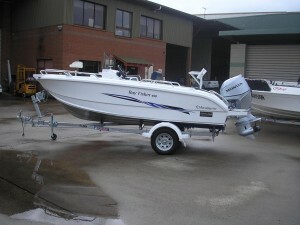 Morningstar 498 Centre Console " Pro" has arrived with loads of standard features & extended transom swim platforms for easy access.The Morningstar plate alloy hulls are a " Revolution " to the alloy boat market offering fibreglass looks & water performance in a robust aluminium medium.Standard features include -: Checker plate self bailing deck,60 litre under floor fuel tank,Navigation lights & bilge pump,Transom live bait tank plumbed,Rear folding lounge,80 litre live well in the seat box,Console seatbox with swing backrest,Front casting platform with storage & lean seat base,Twin transom swim platforms,Stainless boarding ladder,Powered by the Honda F60 Hp fuel injected four stroke motor with unique "BLAST" low RPM power band - exclusive to Honda ,these hulls leap onto the plane & have the perfect power to weight performance.The package includes the Brooker quality braked galvanised trailer with LED lights + gal springs & axel.The above package commences at $29,990.00 including registrations & safety gear.